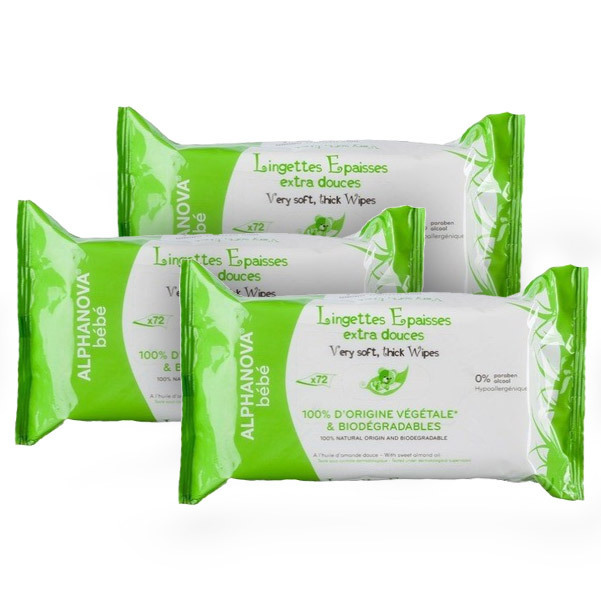 For changing diapers or body hygiene.Three 72-unit packages. Ingredients: Aqua, glycerin, coco-glucoside, amygdalus dulcis oil, sodium benzoate, parfum, benzoic acid, sorbic acid, benzyl alcool, sodium dehydroacetate. Alphanova is a French company specialising in the production of natural and organic cosmetics and food supplements. Alphanova is concerned about globalisation, and has chosen to collaborate with local firms. All their products are made in the South of France using as many local raw materials as possible. The company has created a range of natural and environmentally-friendly skin care products for babies. All Alphanova Baby products are hypoallergenic and do not contain parabens. Alphanova products are subject to quality and safety checks at all stages of production.